Did Bing Maps Capture the Top Secret U.S. Drone Base in Saudi Arabia? This past week, reports have come out about a top secret US drone base inside Saudi Arabia. The base was built two years ago, had been used for dozens of drone attacks in Yemen and was originally hidden by the news until it was revealed this week. Now, Bing Maps may have found it, reports WIRED. 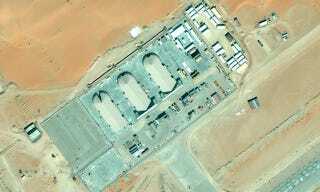 Satellite images show a mysterious airfield base in Saudi Arabia that could very well be the US drone base. Yep, satellite images in Google Maps (which does its fair share of blowing up secrets) doesn't show any sort of airfield base. Bing Maps does. The mysterious base, which can be seen here at Bing Maps, is on the Eastern Saudi Arabia-Yemen border and houses three hangars large enough to hold US Predator and Reaper drones. The clamshell hangars, which measure about 150 feet long and 75 weet wide, are similar to other bases associated with US drones. What's interesting is that this base is expertly hidden. It's in the middle of no where and if you were cruising satellite images at typical resolutions, you wouldn't see anything. The only way to reveal the secret base would be to zoom waaaay in. Also, there was no military base when satellites flew over the region at the end of 2010. Only in early March of 2012 did this base pop up. The sudden existence of the base matches up with the current media reports.